We are told in TFA that she imagines an island while trying to sleep, and in TLJ she says that she’s seen the island ‘in dreams’. You’re right that a dream sequence wouldn’t outright contradict anything, but the only prior time in which this type of sequence has been done in Episodic Star Wars has been Anakin and his Force visions. I think there’s a strong assumption in Star Wars that such a sequence would be Force related even if it’s not explicit, and that’s the sort of assumption that I want to stay away from at the beginning of the movie anyway. I can’t even tell when I try to look. Well done. Nicely done, Neverar - to me that was seamless. That’s a part of it. 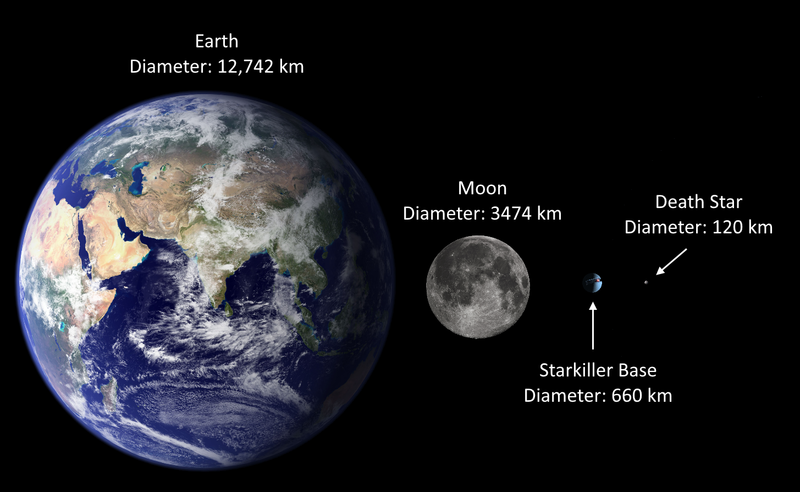 Another thing was brought up by someone here (I forget who), saying that they originally thought that the Starkiller was built within a planet to save cost compared to the Death Star. When they then saw how the Starkiller’s weapon emitter alone was almost the size of the Death Star, it negated that bit of cleverness. Even though the audience on some level understands that it’s the size of a very small moon, the way it is portrayed as large and imposing in the shot sells the threat. So by removing comparisons to any object of reference, it’s easier to imagine the scale of the station to be whatever size makes the most sense for a person’s individual view of the First Order and their abilities. I know this is anecdotal, but this reminded me of a dinstinct memory I had from TFA opening night. The line, “This was the Death Star. And THIS is Starkiller Base!” felt so on the nose. Kinda one thing about the movie that makes you roll their eyes, like they’re trying to one-up the Death Star. I figure the writers wanted the audience to know that they were aware of the similarities and wanted to bring that up within the film. Honestly though, I think that just makes it worse. Just let it be its own thing. I also think the brief pause in dialogue before the hologram pops up helps to make the moment a little more omninous too. Yep, and you’re right it might be funnier in this context. The shortened dialogue with Kylo at the end gives some ambiguity as to which sensors were triggered, hopefully lending more tension to Rey’s escape. That’s pretty cool! That’s a nice new transition you’ve made, and it sounds good. I also like the quick cut to Kylo Ren’s face and the intense strings, during Rey’s second attempt. In this version, you do lose that idea you had though about Han and Finn’s arrival distracting Kylo and buying Rey enough time to escape. Although I’m guessing you’re still trying to imply their arrival somehow encouraged Rey to try again, right? EDIT: Also, nice touch with maintain special continuity by having the room Kylo exits be the observation room through use of the glowing light effect in there. Pretty clever! Oh yeah, maybe that’s where I got that idea from. I think you previously suggested that one could add some com chatter that basically says the same thing the other stormtrooper says to Kylo. Another update to the Starkiller infiltration, continuing to weave the scenes into a more interconnected whole. So there are a lot of changes throughout, such as a shortened Falcon crash landing and additional lines for Phasma from the Battlefront game. The shortened crash was actually a suggestion of my girlfriend, who has been pushing for a less jokey final act. Her thesis for the humor of Star Wars is that by the final act of a movie the humor is almost entirely physical/situational rather than quippy lines due to the earnest tone, which I quite agree with. That is also why Finn’s dialogue with Phasma is shortened. I’m still having trouble integrating comm chatter into Rey’s cell. Ideally it would inform her of the Falcon’s landing and add that final impetus for her escape. I really really like what’s happening in these edits! Keep it up, Nev!